100 educators---some from districts with 70 students...some from districts with more then 40,000 students. Some teachers, librarians, administrators, curriculum/instructional specialists, and IT staff. Some with primary students and some with middle and high school kids. Some with little knowledge and experience with educational technology and some with significant expertise. All of whom needed and deserved some personal attention and individualization during the day. 100 laptops---with needs for tables, AC power (that wouldn't blow the circuits), and wi-fi. All in different shapes, sizes, and operating systems. Some locked down tight by IT requirements...some easily accessed by teachers. 100 lunches---including accommodations for vegans, vegetarians, diabetics, and various food allergies. Nearly 100 different travel arrangements to make sure everyone could get to the event. 8 hours---to summarize nearly four years of work and build anticipation for the future. Put all of this together in a single room, and you have my Tuesday. It was a little bit like being on the world's largest field trip: a million little details, an extended learning purpose, working to meet so many needs, taking attendance. But it was also much more than that. Any journey with teachers---especially those who voluntarily give up a day with their students and take time away from their family and colleagues to share and learn with others---is an awe-inspiring experience. It was also a humbling one, with such amazing people to support and serve. It was a good learning experience for me. Large groups are difficult to plan for and manage. As much as I hate "sit and get," when you have 100 people with laptops in a single space, there aren't a lot of options. So, we tried to alternate delivery of information with as much time for table work and discussion as possible. Pacing-wise, we did pretty well. We kept to the agenda, even though some things felt rushed. I wanted people to have time to plan, but we also needed to be sure we gave them the information to plan with. Since we will have another event like this in three months, I have time to learn from this past one and make a few adjustments to the timeline. Evaluations were mostly positive---people felt like they got what they needed. Some pointed out (and justifiably so) the sedentary nature of things. A few indicated that they came expecting one thing and left with something different---not necessarily in a bad way. We definitely can be more vigilant about stating goals, but so many people are signed up to attend by others that I'm not sure how clearly things are communicated before they arrive. I am grateful for the wisdom of the crowd present this week. I admire their willingness to represent the best interests of their schools and their courage to share what they know and are still learning. I am hopeful that the seeds we've planted with these assessments and goals will bloom and bear fruit for students throughout the state. Update: PD is hard on the feet. 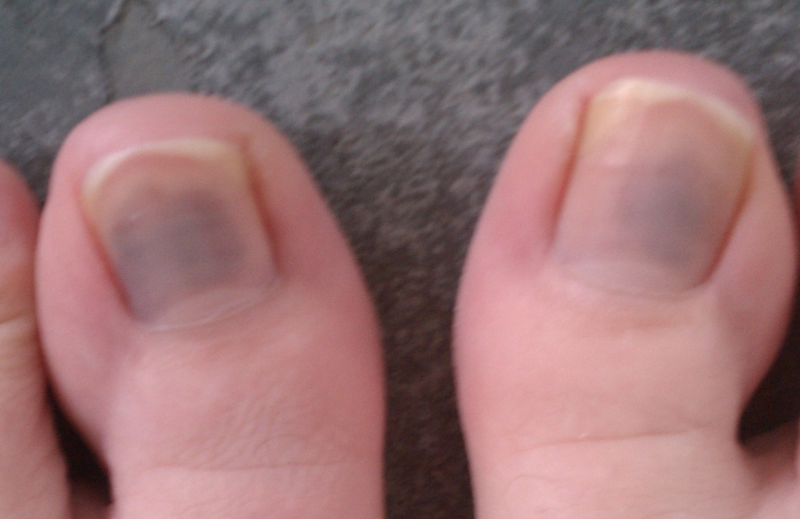 Here are my poor bruised piggies from that day. Ouch. But your shoes were really cute... :) You always do a fabulous job of thinking of all the details.